If I were told I could only make (and eat) one soup for the rest of my life, I’m pretty sure I’d choose this one. It’s an intoxicating blend of the exotic and the comforting and I defy anyone to have just one bowlful. Don’t be intimidated by the ingredient list – just get yourself to a nearby health food store and pick up small amounts of the seasonings. Chop and measure everything before you begin; the soup comes together in a jiffy that way. I’ve adapted this from a recipe given to me years ago by the nice people at Perfection-Satisfaction-Promise, one of the finest little vegetarian eateries in Ottawa. Just looking at this photo makes me smile in anticipation. I hope you love this lentil soup as much as I do. 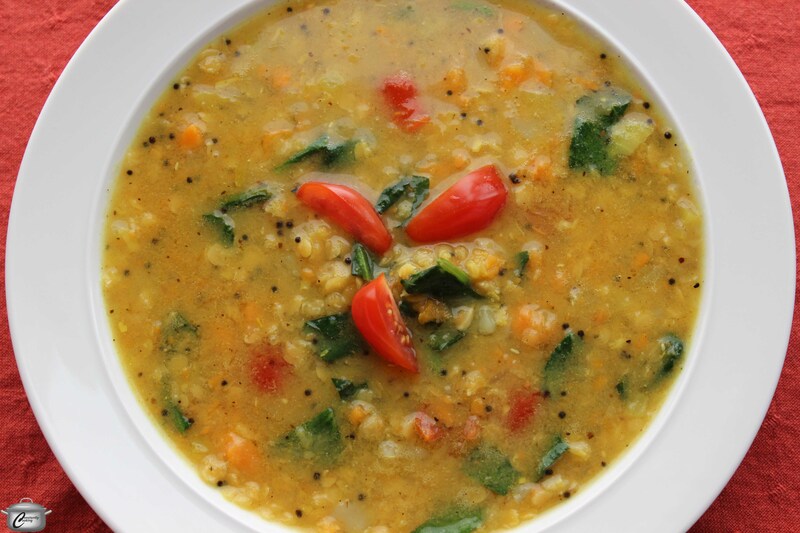 This lentil soup has a subtle yet complex flavour, thanks to the blend of seasonings. It’s a great way to introduce people to vegan cuisine! Pick over the lentils to remove any stones and rinse thoroughly in a sieve. In a large pot, add cleaned lentils and 6 cups of water. Bring to a boil then simmer until the colour of the lentils changes from orange-red to yellow. In another pot, boil the sweet and white potatoes with just enough water to cover the top of the potatoes. When the potatoes are soft, mash with the cooking water until they are beginning to look smooth (I like to have some tiny chunks of potato in the soup for a nice contrast of texture). To fry the spice mixture, heat the oil on high in a medium-sized frying pan or pot that has a tight-fitting lid and add the mustard seeds. Once the seeds have finished popping, add the onions and increase the heat to medium-low. When the onions are beginning to soften (after about 2 minutes), add the garlic, ginger and powdered spices. Stir frequently to prevent them from sticking to the pot. When the onions are translucent and the spices are deliciously fragrant, lower the heat and stir in the tomato, lemon and spinach to simmer lightly for 2 minutes, stirring occasionally. Stir the spice mixture and potato mixture into the cooked lentils; stirring to blend well. Taste and adjust salt; you can also add water if the soup is thicker than you prefer. Makes 6 to 8 servings, unless you’re me. I could eat the whole big potful. This entry was posted in Recipes, Soups and stews and tagged black mustard seeds, cumin, garam masala, garlic, gingerroot, lemon, lentil, onion, potato, spinach, sweet potato, tomato, turmeric, vegan, vegetarian. Bookmark the permalink. I had such a hard time finding black mustard seeds in Kanata – I went to 4 different stores – finally found brown ones at Grace in the Kitchen. Hope it still works. Making this for dinner tonight. Hi Tracey, I am sure it will be great with brown mustard seeds. And I agree, it can be hard sometimes to find specialty spices – ethnic grocery stores are often a good option (though I know of none in Kanata). There will be a great new spice store downtown next year – Cardamom and Cloves! Hope you liked the soup. Thank you for sharing this wonderful recipe soup with us. It’s absolutly delisious and makes the house smell so good. I also didn’t find any black mustard seeds, so used white ones. Last week I made your Roast Butternut Squash soup (again awesome) as well, and after finishing all that off, it was time to try my hand at soup making again, and again in was a success!!!! Thanks so much for your kind comments! I am so glad you are enjoying my recipes. I do love making soup all year round but especially during the winter. I was working on a new kale salad today that I think will be a real hit – just a few ingredients and very bright and fresh tasting. I’ll be posting it soon so hope you’ll be back to visit again!